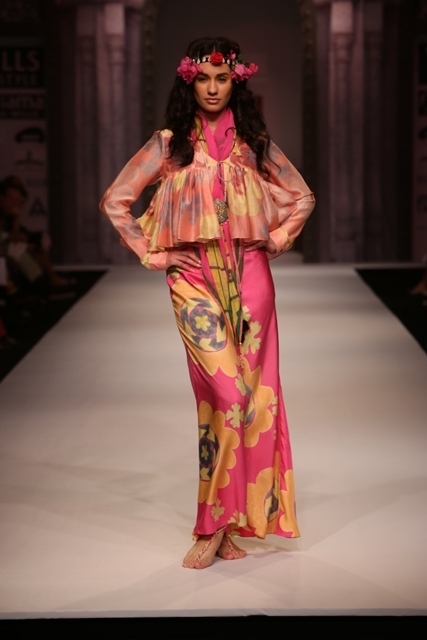 Internationally acclaimed fashion designer, Anupama Dayaal kicked off Wills Lifestyle India Fashion Week Spring/Summer14 with an explosion of colour and bold prints. 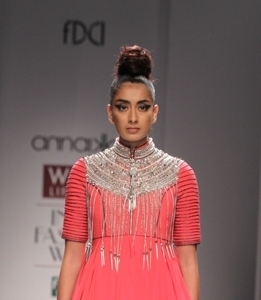 Some collections could be viewed as transcending seasons, however, Anupamaa’s screamed SUNSHINE. 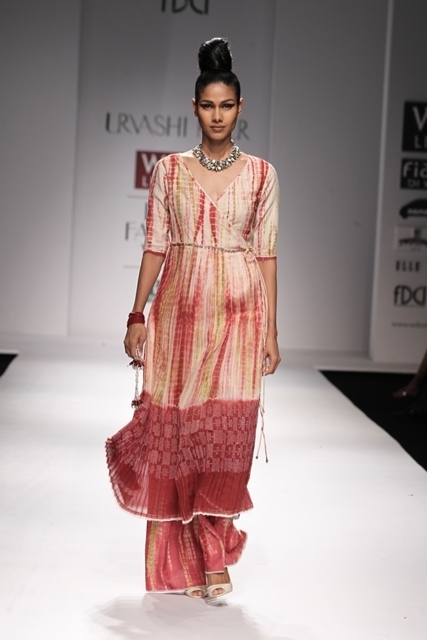 Bright pinks, orange and yellow tones worn with tousled hair and beach foot accessories completed the looks. 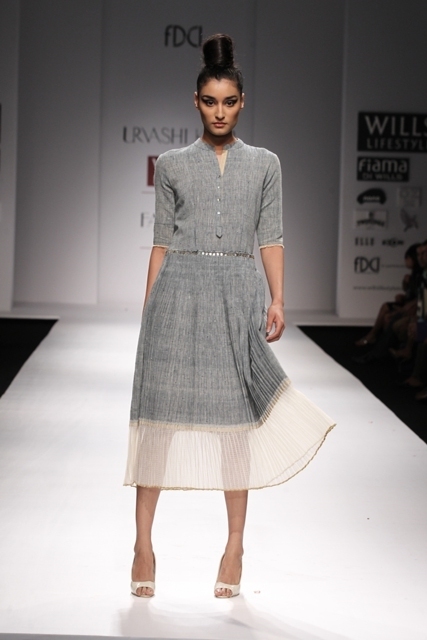 Anupamaa claims to utilise a secret ancient printing process on her textiles…whatever that may be it seems to work. 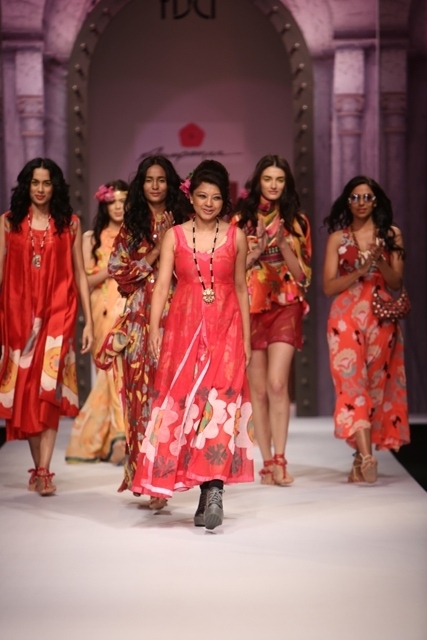 Designer Masaba shared the opening slot beginning with young Bollywood actress, Alia Bhatt wearing the first look. The reference points of classic literature, hem lengths and the 1920s and traditional golden zari embroidery resulted in a somewhat incoherent message for me. 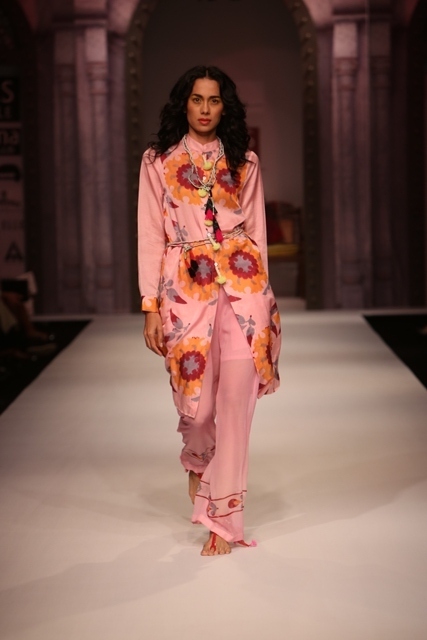 The colour palette of black & white was in tune with some international collections such as Ralph Lauren, however, Masaba’s collection included washed pink and ice blue. The focus of the collection was on high necks with embellished yokes and edgy finishes. Swinging chains and other hardware packed a punch in the otherwise feminine designs. Colours varied from pale pistachio to bronze, inky tones and corals. 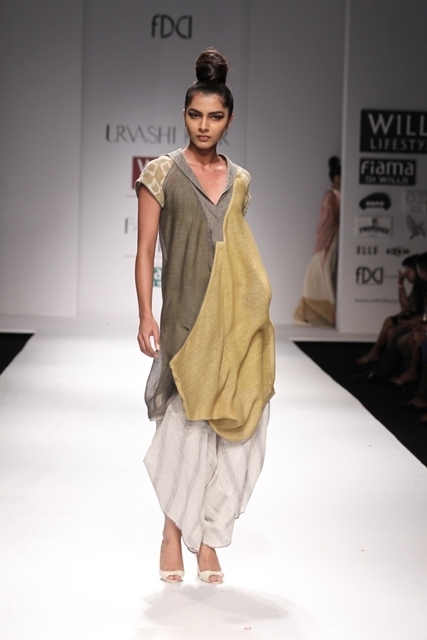 Inspired by Sufism and Rumi, one of the great Sufi poets (and a personal favourite of mine) Urvashi Kaur’s collection aimed to capture the harmony of nature and all the elements. The designer used an organic and restrained palette of colors encompassing natural dyes like indigo, reds, greys, ochre, and ecru.